Actually, the “real” current location as I write is home at Sunset House in Grants Pass Oregon. 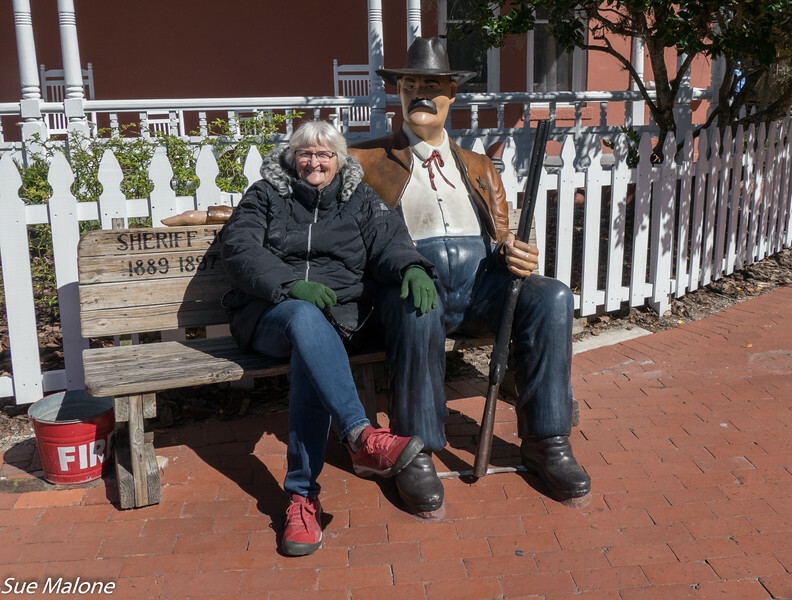 I did a decent job of keeping up the blog during our travels, all except for this visit to Saint Augustine. 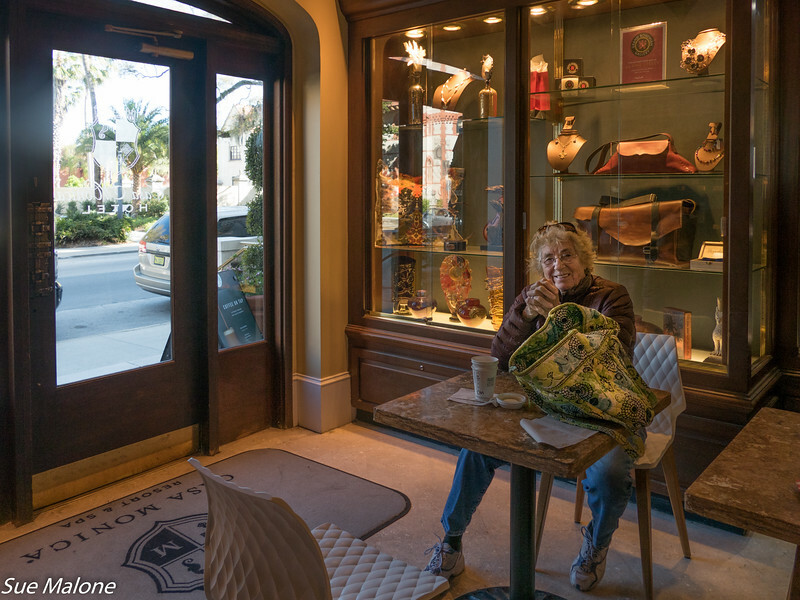 One of the most difficult parts of writing this particular story is the overwhelming amount of fascinating history that is associated with the city of Saint Augustine, and with each of the beautiful buildings that we visited. As I attempted to write, I found myself getting completely overwhelmed, and have decided that instead of rehashing all the history of each of the places we visited, I will add links that you can peruse at your leisure if you are interested. I’ll write what we saw and how we felt, and if you want the rest of the story, you can follow the links. It is the only way I will ever get this post completed. 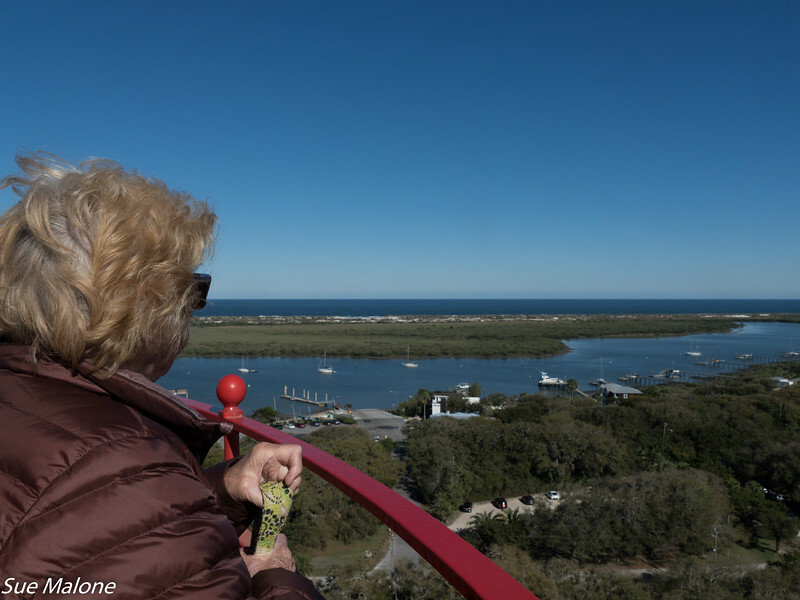 When we once again piled into the Tracker for the trip across the bay from Jacksonville to Saint Augustine, we were more prepared for another expected cold day. I wore shoes and warm socks and dug my winter coat out of the storage bin in the Tracker to brave the chill. Coats and warm shoes and socks made a big difference but the sunshine was an additional bonus in spite of the chill. The Casa Monica Hotel was impressive both inside and out. Arriving a bit early for our 10AM tour, we wandered the streets nearby, enjoying the complexity and loveliness of this part of the city. We delighted ourselves with a coffee and shared a pastry at the luxurious Casa Monica Hotel. I walked around the lobby, feeling a bit nervous looking for the bathroom, expecting to be expelled from the hotel as a lowly tourist rather than someone staying there. St George Street was beautifully quiet at this early morning hour, and we enjoyed a view of the Basilica from the outside, waiting for the Ash Wednesday services to end so we could visit the lovely interior later in the day. We discovered later in the afternoon that visiting St George Street was much like any other busy tourist town, with lots of stores full of “stuff” and lots of people. It wasn’t a place we chose to hang out for long. 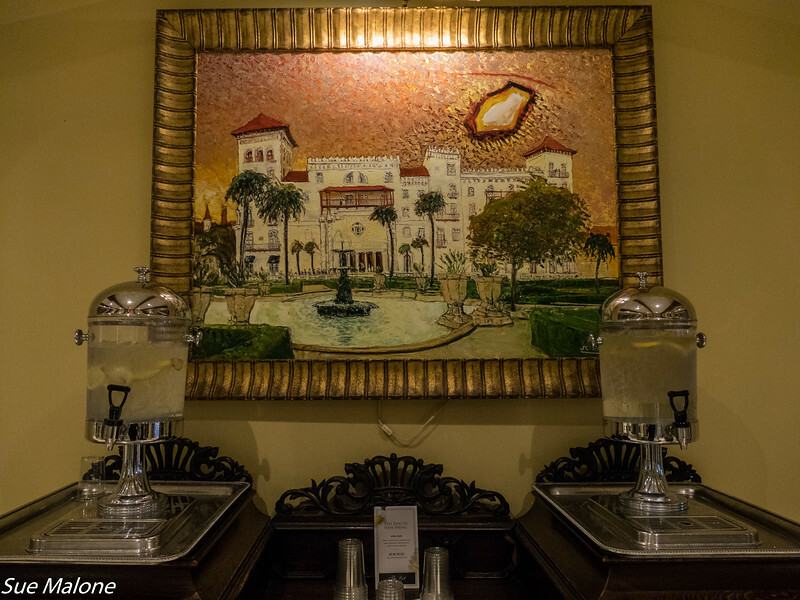 The magnificent Ponce De Leon Hotel was built between 1885 and 1887 by Henry M. Flagler, the hotel and railroad magnate whose activities contributed greatly to the development of Florida’s eastern coastal area. Upon entering through the main doors, the magnificence of the lobby and the beautiful dome is overwhelming. Covered with gold leaf and painted with gorgeous murals, surrounded by hand carved oak pillars, and underlain by stone and marble floors, it is as luxurious and opulent as almost anything we have seen anywhere in the world. 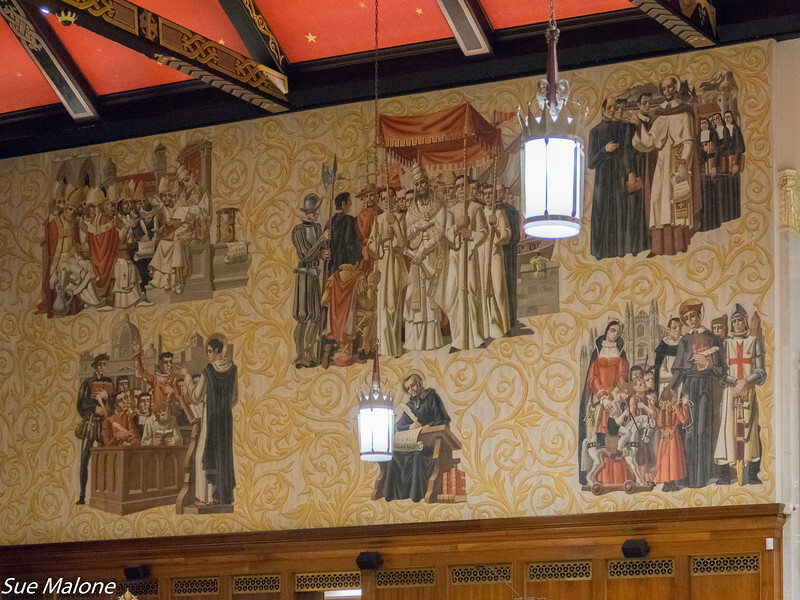 The interior of the hotel is decorated with imported marble, carved oak, and gorgeous murals. 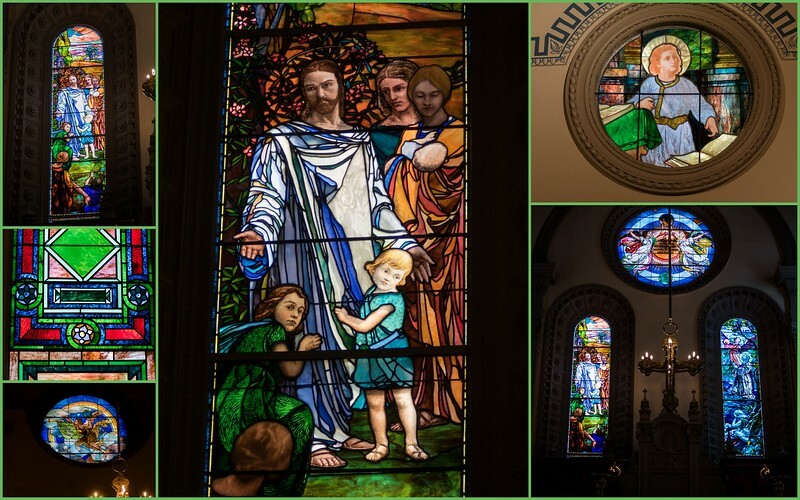 The stained glass windows were created by Louis Tiffany of New York. 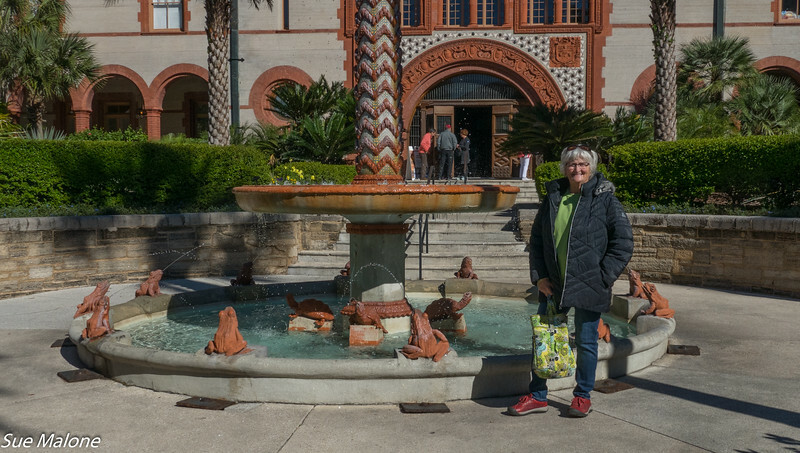 We were escorted on our tour by a student who explained to us the history of the hotel, the history of how it was converted to Flagler College in 1968, and several tidbits about the artists, the interior and the construction of the hotel and what it was like living there as a student. Can you imagine eating meals every day in this room? 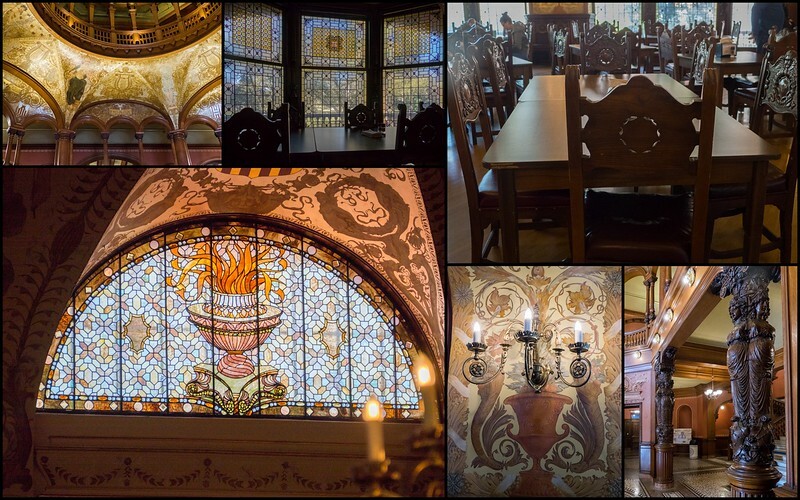 We visited the dining room, surrounded by Tiffany windows, elaborately sculptured dining tables and chairs where students went about their business, well used to the groups of gawking visitors. 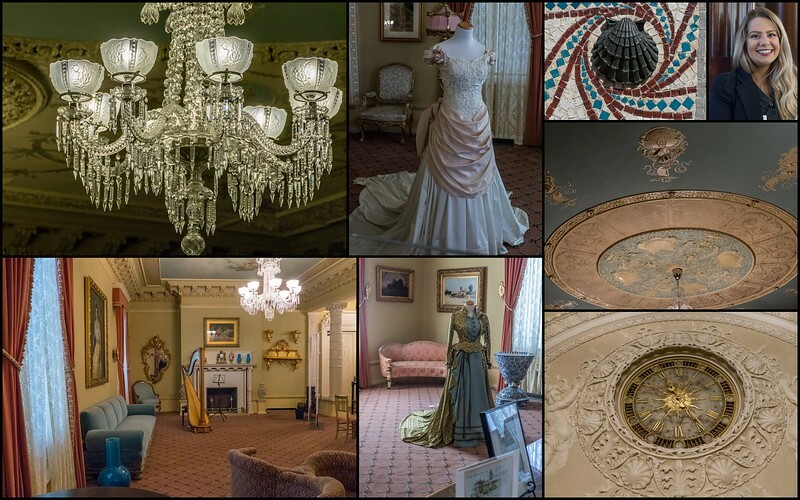 We were shown the beautiful ballroom, with portraits of Flagler and his wives, and examples of the kind of dress that was expected when one went to dinner at the hotel, mingling in the parlor for the women and of course the cigar smoking library for the men. We then viewed the courtyard and listened to stories of a hotel with running water and electricity in every room, in the late 1800’s, completely unheard of. We enjoyed the fine details of design, with overlapping themes of shells and water, with a frog pond that also functioned as a sundial. I highly recommend making time for the student guided tour, worth the effort, and a wonderful way to experience the hotel more deeply than you might just wandering through on your own. After completing our tour of Flagler College, we walked a few blocks west to explore the beautiful Memorial Presbyterian Church. Another of Flagler’s masterpieces, the Flagler Memorial Presbyterian Church was built by Henry Flagler in 1889. 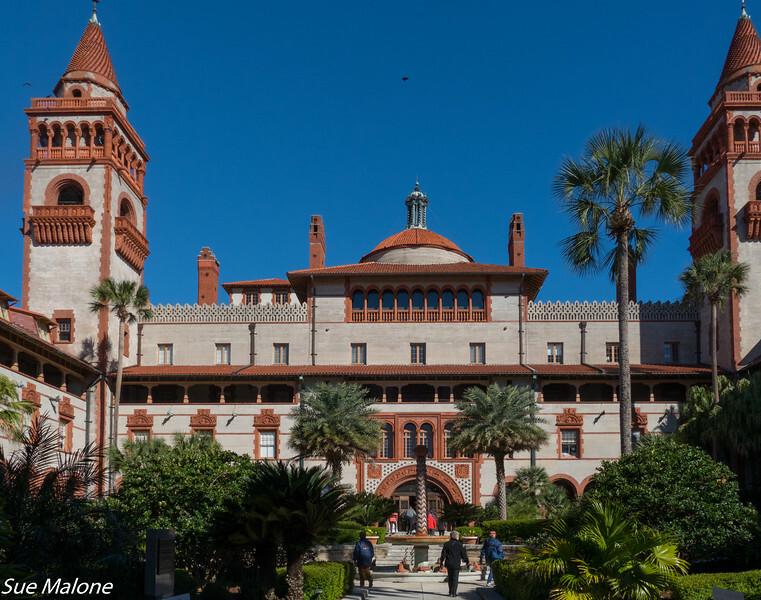 It is one of his most significant projects, because it was constructed as a memorial to Flagler’s only daughter, Jenny. The mausoleum adjacent to the church is where Flagler, his daughter, granddaughter and first wife are buried. 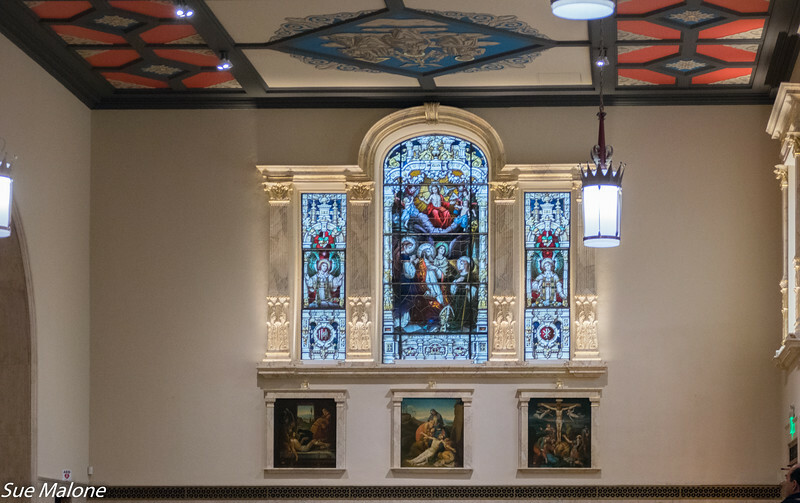 The stained glass windows are breathtaking, and while not done by Tiffany himself, they were created by his protegé who also worked with Tiffany on the windows at the Ponce de Leon Hotel. After our visit to the church, we wandered back in the direction of St George Street and the Cathedral Basilica. It was Ash Wednesday, so the sanctuary was basically off limits to casual tourists, but we were allowed to enter during the services as long we we were quiet and respectful. 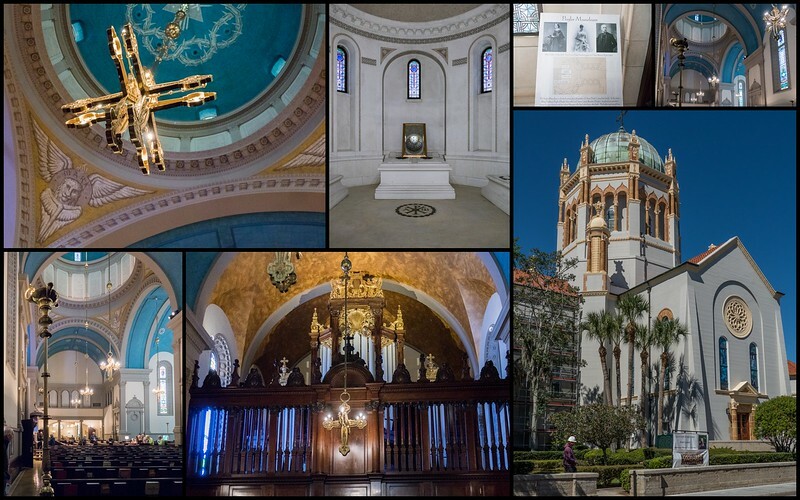 The Cathedral Basilica of St. Augustine is home of the oldest parish of a permanent European settlement in the country. I wasn’t able to get to the front of the church during the service but did manage to take a couple of photos from where we sat quietly in the rear. 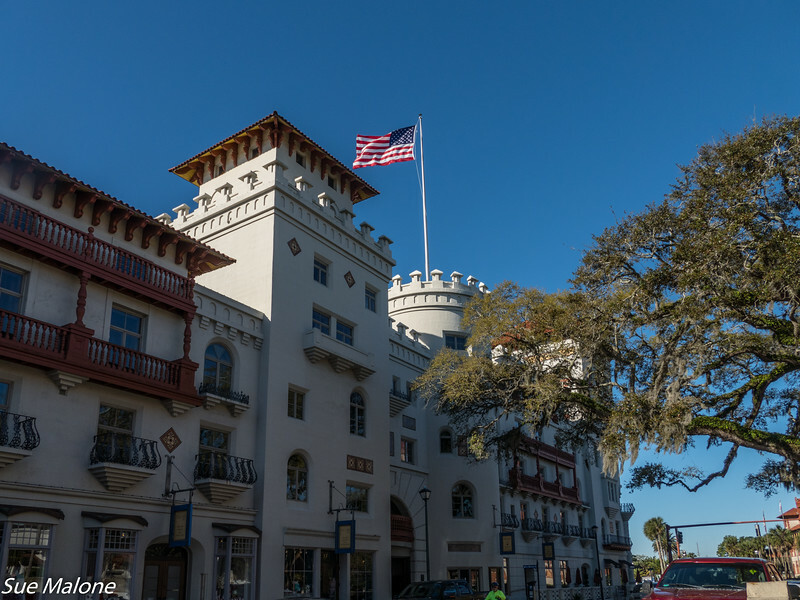 We followed Pam’s suggestion to skip the trolley stops in favor of walking the downtown area, meandering along St George street toward the Castillo. 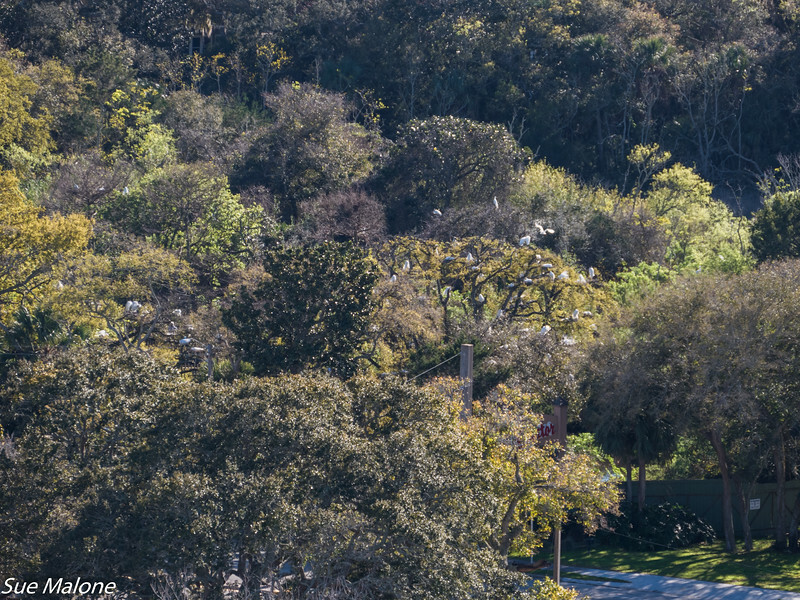 We were getting a bit worn, and knew we had yet to see two more iconic sites in St Augustine. On the previous day we had passed an Irish pub along the main street, and with a quick check with Google Earth, realized we were right on the path to another place to warm up with lunch and an Irish Coffee. 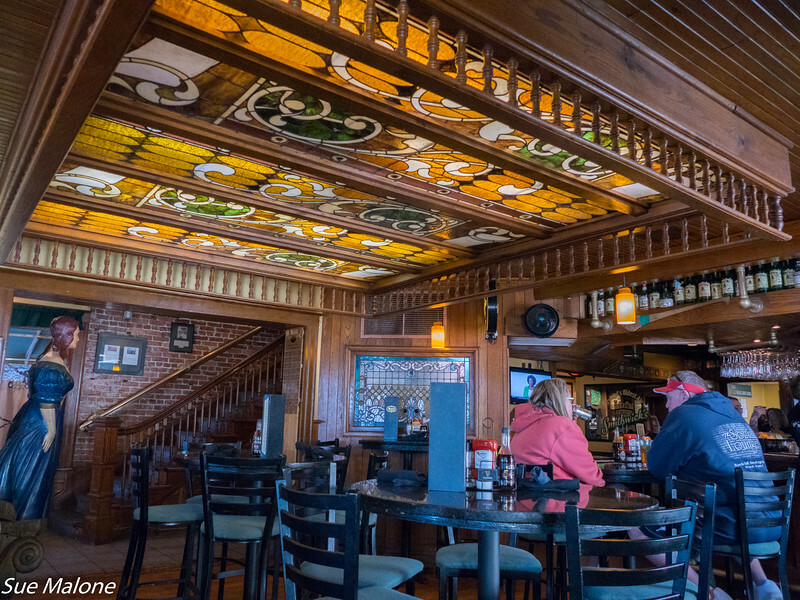 Meehan’s Irish Pub was just the ticket for a chilly day in March. 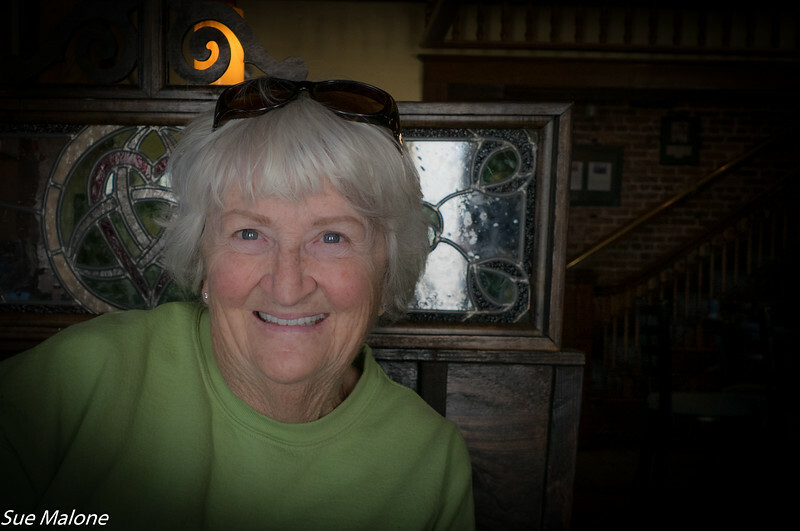 We ignored the open air porch on the second floor and instead settled into a nice little corner table by the window downstairs. Instead of Irish coffee, we decided on cold beer, and with Guinness on tap I couldn’t resist. Mo had something else since she isn’t a dark beer lover. Irish chips and corned beef egg roll appetizers were a great lunch. Thus fortified, we were ready to continue our day of sightseeing and walked a few blocks down the street toward the beautiful Castillo de San Marcos. The fort looked much more inviting on this lovely sunny day that it had on the previous day shrouded in cloudy skies. The temperatures were almost warm enough that we could open up our coats! 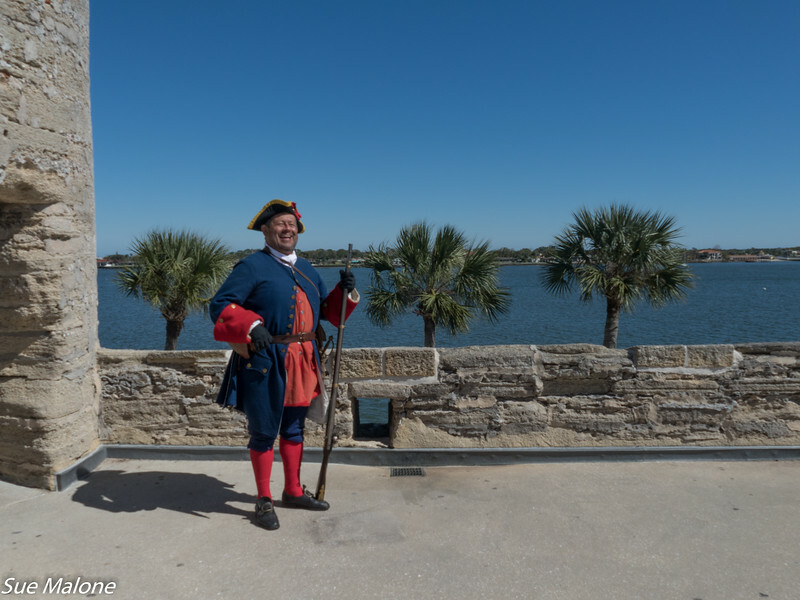 Castillo de San Marcos is the oldest masonry fort and the best preserved example of a Spanish colonial fortification in the continental United States. 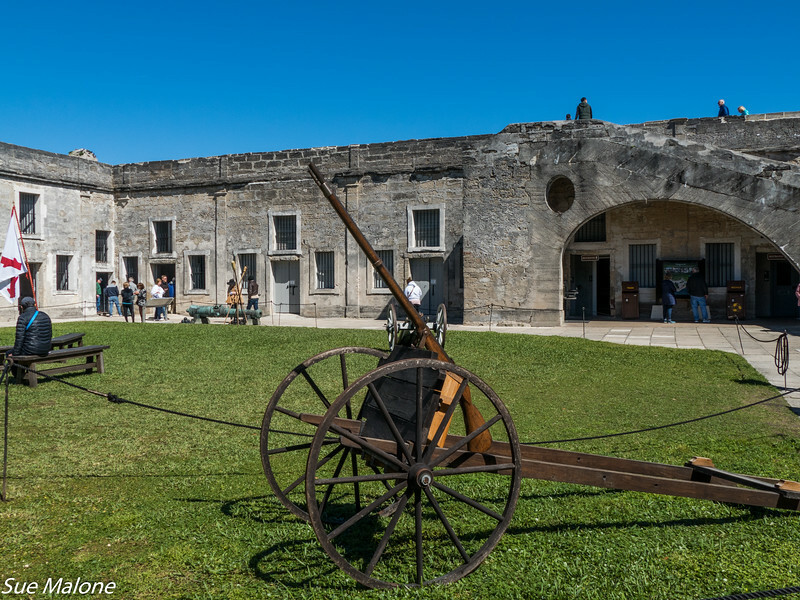 Much of the history of Saint Augustine and of Florida in general is contained in the history of this dramatic fort. It protected Saint Augustine from pirate raids, and from Spain’s major rival, Great Britain, during a time when the Florida-Georgia-Carolina coastline was an explosive international battleground. 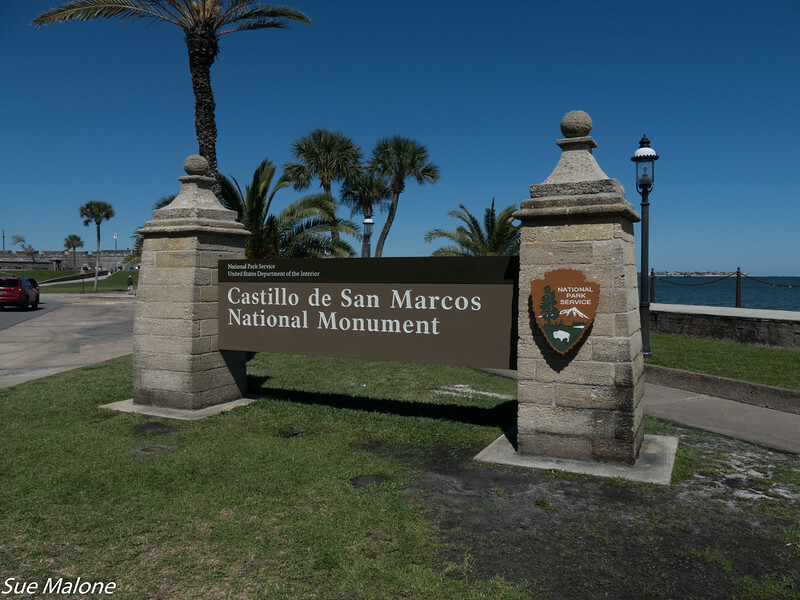 Spain built the Castillo de San Marcos to counter the attempts by the British to take Florida. 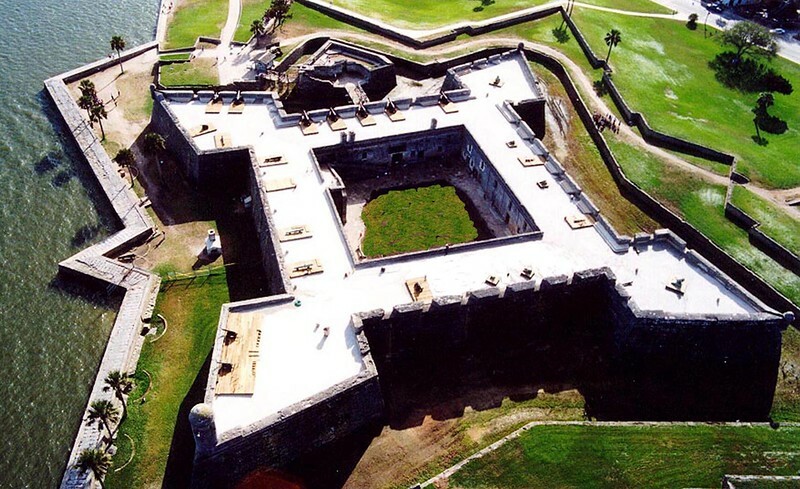 Begun in 1672 and completed in 1695, the fort replaced the nine wooden forts that had protected Saint Augustine since its founding. The design and construction of the fort was so amazing that it was never actually taken in battle, with ownership of the fort only occurring through treaties and agreements. It withstood several sieges, and never actually fell to an enemy. 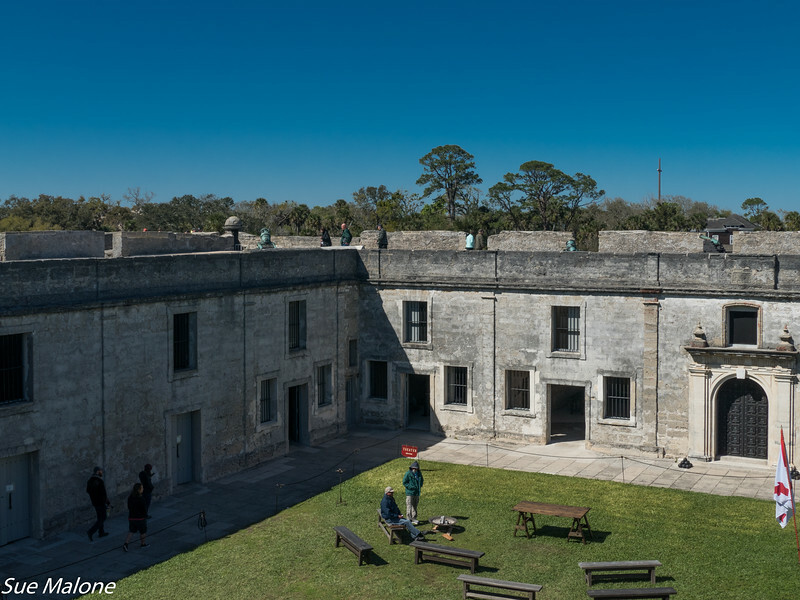 The fort is small but quite beautiful, constructed from blocks carved from coquina, a shell filled limestone that is somewhat soft. 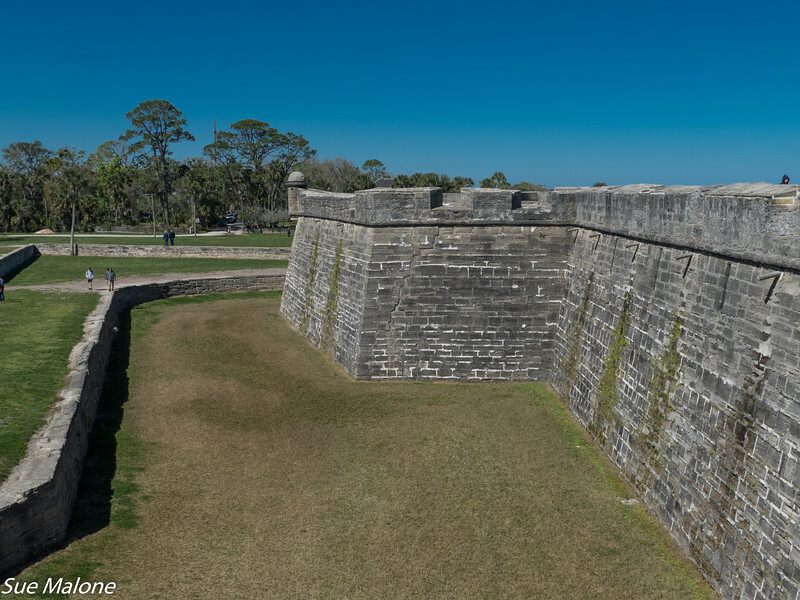 The simple square design is fortified by diamond shaped bastions on each of the 4 corners, sloping walls that descend to a moat, and cannon arranged so that they can fire in overlapping directions. A story that each of the trolley drivers loved to tell was how the British would shoot cannon balls at the fort, and they would simply stick in the soft rock. The Spaniards would retrieve the balls from the walls and shoot them back at the British. The laughter was a reply to my question if they use 6 pound cannonballs for the reenactments. We enjoyed exploring the fort, and watching the short theater presentation of the re enactment of shooting the big cannons. We later spoke to a ranger in period dress who said they shoot the cannons every weekend, but the neighbors across the inlet didn’t like the cannonballs, so there are only 1/2 pound balls shot instead of the 6 pound balls that the cannons can shoot for a distance of more than a mile and a half. It was getting late in the day when we returned Old Town Trolley for a ride through town back to our car. 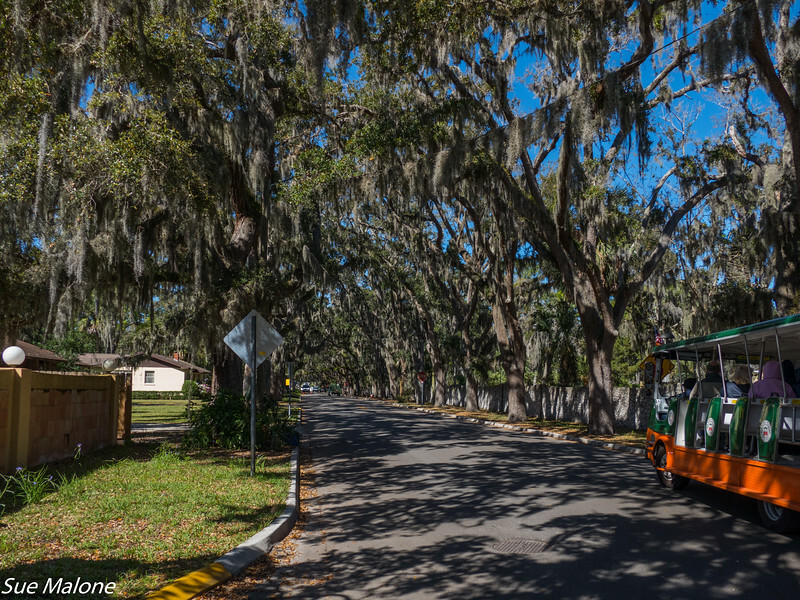 Although there is a trolley bus that will cross the Bridge of Lions to the St Augustine Lighthouse, we wanted to be independent of any kind of schedule and take our time visiting. 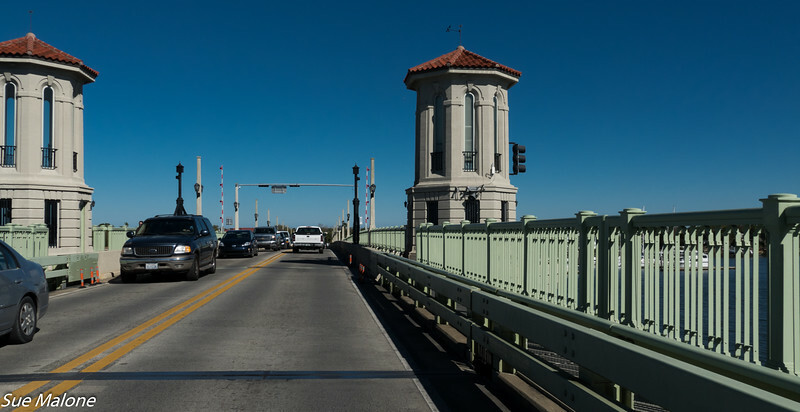 Once back to the Tracker, we settled into the fairly heavy traffic flow south through town and toward the bridge. 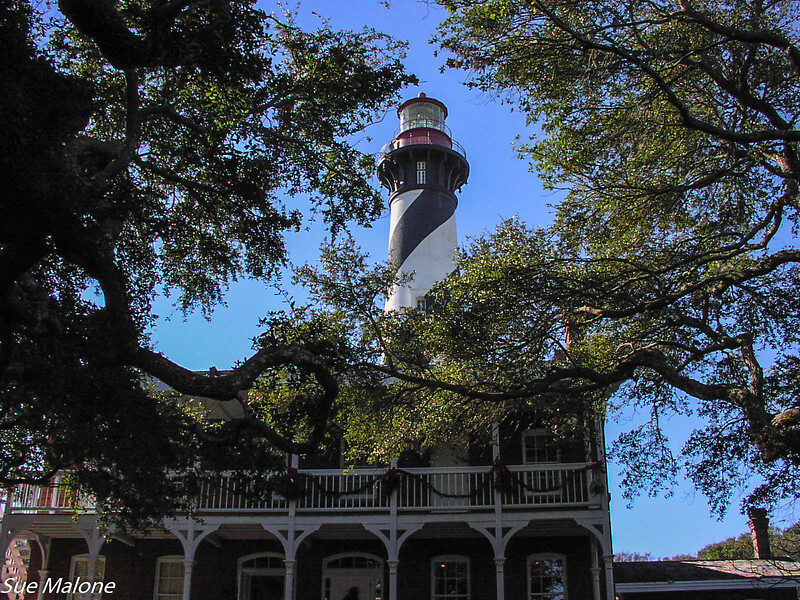 We were lucky enough to miss any kind of drawbridge lift, and in no time were across the inland waterway toward the beautiful lighthouse. Even this late in the day, parking was tight, but we managed to find one of the last spots in the tiny parking lot at the lighthouse. 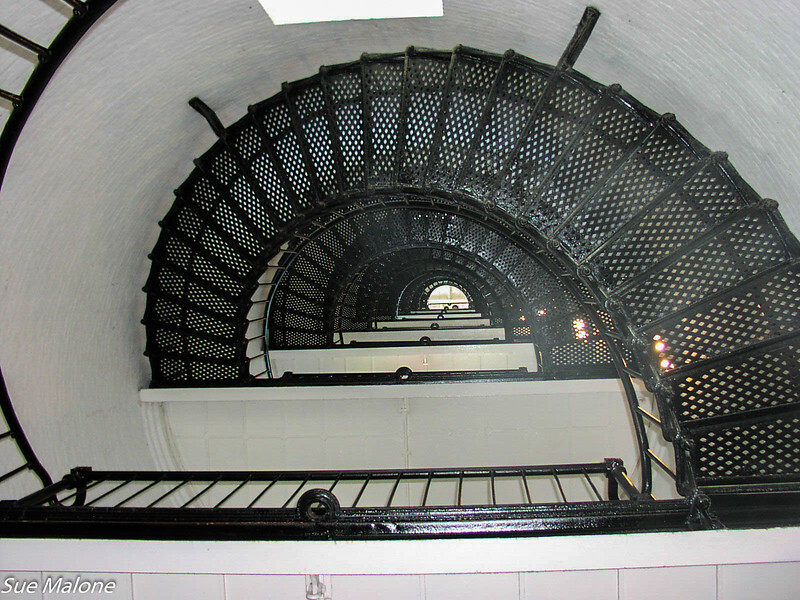 The museum is lovely, the grounds are beautiful, but the most fun of course is the 218 step climb up the winding stairs to the top of the lighthouse. It really isn’t a bad climb, with nice wide landings about every 20 steps or so and plenty of room to pass people going up and down. Nothing like those towers that daughter Deanna and I climbed in Italy last fall! 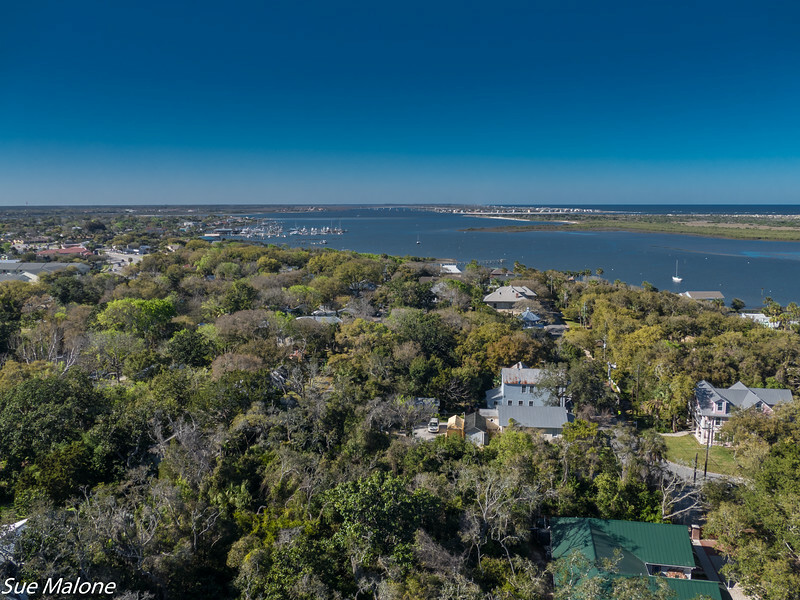 The best part of the climb is the gorgeous 360 views of Saint Augustine and the barrier islands between the lighthouse and the Atlantic Ocean. We could see some rather amazing kayaking routes from that height, but knew that this time around, those paddle routes would be left to other boaters. We also saw a tree full of nesting spoonbills and wood storks at the Alligator Farm down below us a few miles south along the highway. Without any desire to pay another entrance fee, and to try to park and deal with crowds, we let our desire to view of the birds go. It had been a very long day, with an overload of gorgeous architecture, complex history, lots of walking and climbing, and we still had to get back through Jacksonville traffic to get home. I haven’t even come close to talking about all the other “attractions” (the ones we didn’t visit, that are part of seeing Saint Augustine. There is the Fountain of Youth, the Potter’s Wax Museum, Ripley’s very first Believe It Or Not, the Old Jail and the Oldest Store and Museum, There is the Alligator Farm, Mission of Nombre de Dios and the Our Lady of La Leche Shrine. 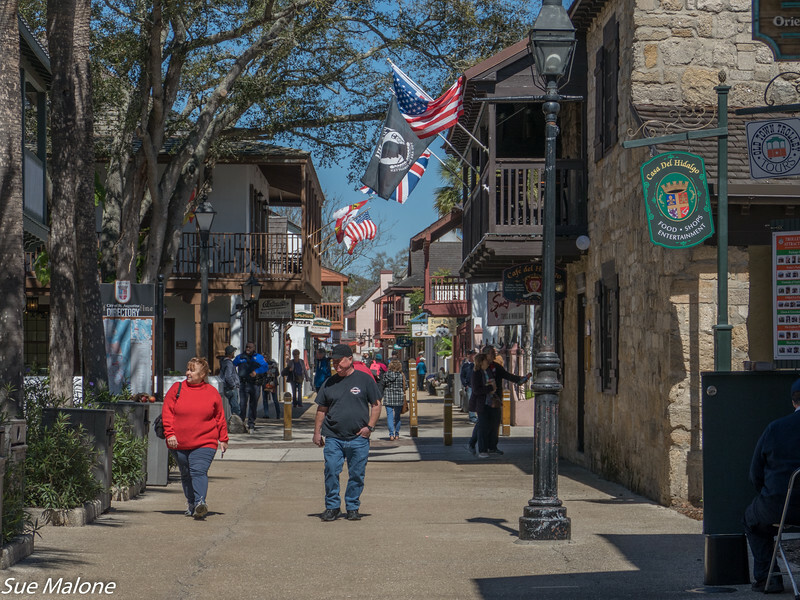 There is the Spanish Military Hospital Museum, the St. Augustine Pirate and Treasure Museum, the St Augustine Aquarium, scenic cruise tours, private sailing charters, pirate ship adventures, helicopter tours, and zipline canopy adventures. Food and drink are everywhere, with breweries, restaurants, hotels and B and B’s filling in what few spaces are left. It is a busy place, feels somewhat like Disneyland at times, and it takes planning and some discipline to not get overwhelmed, especially with just a short visit. Completing this post feels somewhat like I felt that last day that we visited Saint Augustine. Wonderful, a bit overwhelming, a bit exhausting, and yet something I am so glad we did. I am also very glad that I did write this post instead of following my temptation to just skip it and let my photos be my own personal reminder of our time in this beautiful historic city. You probably know this, but I'll fire away regardless: Jacksonville is the most populous city in Florida, the most populous city in the southeastern United States and the largest city by area in the contiguous United States. You definitely know it's the largest city BY AREA! You covered quite a bit of it, too! While Jimmy and I lived in Tallahassee, we traveled to Jaxville occasionally, visiting the fort and lighthouse, etc, but missed the Basilica, etc. Be good to go back to see these beautiful places. Congrats on finishing a wonderful, wonderful trip! It’s an amazing city! To do it properly, a person needs at least a week.... Like y’all, we squeezed in some highlights in a single day. Really liked the fort and Ripley’s. Thank you for exploring more of St Augustine than I ever did. If I don't post about a journey/adventure soon after it happens, it typically never happens. Nice job. Great trip. Now I feel no need to return to FL any time soon. I’m glad you wrote this post too. I totally understand how a post like this can be overwhelming when there is so much historic and other info you want to share. It’s why so many of our trips never made it to the blog. When I decided to try to maintain Two to Travel now that I am down to one blog, I also made the decision to cut down on the detail ... give a few basics and provide links for people to follow if they are further interested. With few exceptions I know that readers often skip all the detail anyway. We’ll see if I can stick to that decision. After reading your post, I wish we had made a second trip back to St Augustine ... still so much to see and do that we missed last time. 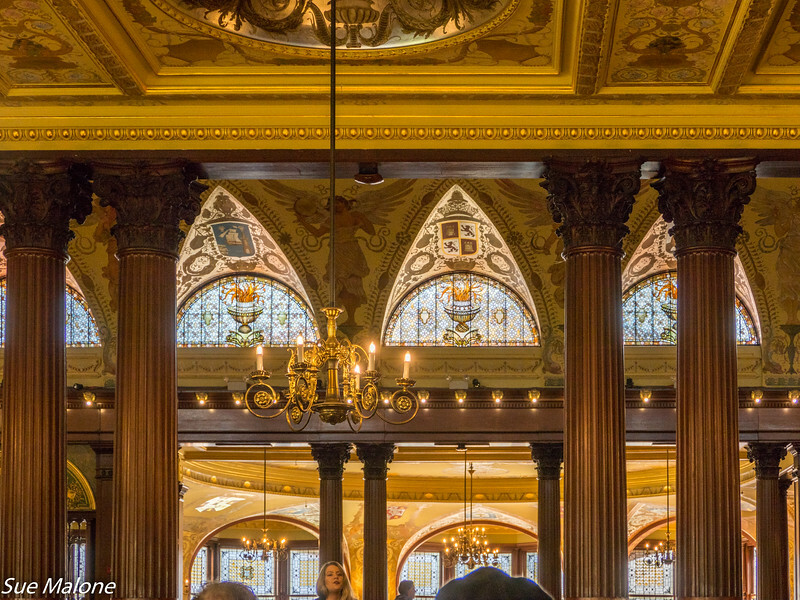 When and if we do get back there, I am definitely going to add the Flagler College tour to our itinerary. Gorgeous Tiffany windows. Have to check out the ones at the church, too. We almost never go into churches in the US ... often they are locked up tight ... but will have to at least tug on the door to see if they might be open the next time we want to check one out. We really enjoyed the castillo and the ranger program. Don’t remember the story about the cannonballs being shot back at the enemy ... but maybe we didn’t hear it because we didn’t do the tram tour. Good advice from Mui, that is exactly what I tried to do! 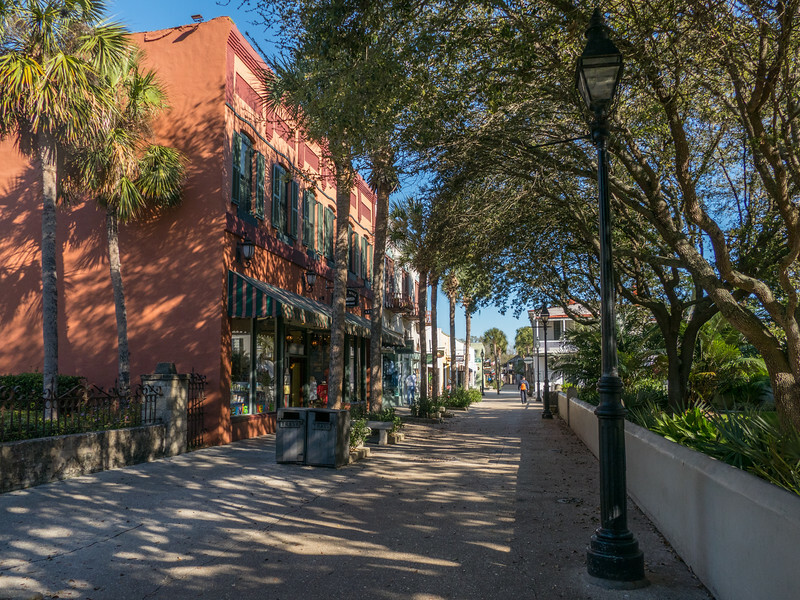 I think you would love to see St Augustine again, although like us, you might not want to drive cross country to do it! 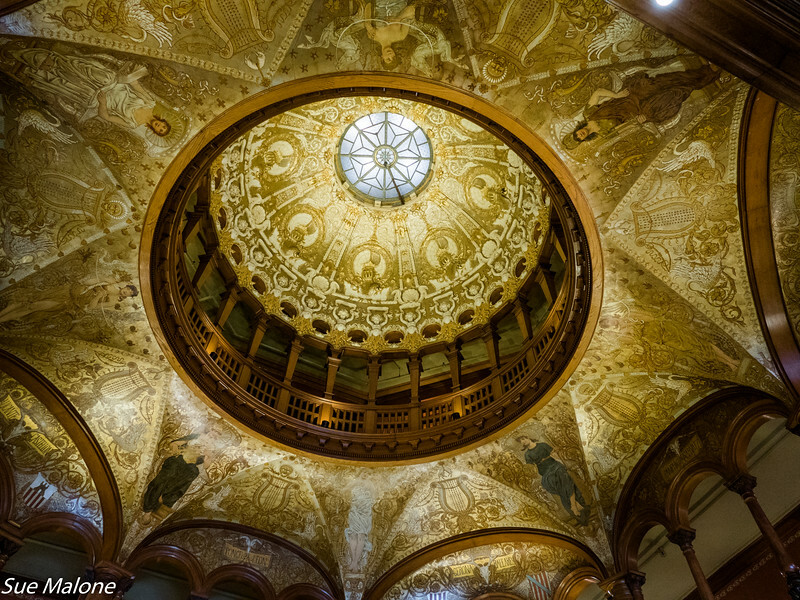 Flagler College is a true wonder, and I am sure you would love it. Thank you for the wonderfully written narration to go along with the pictures. You and Mo sure have a lot of energy to get all this done in a day. 03-10-2019 Okefenokee Don’t Ya Love that Name! ?